Shimla Hills, one of the leading names in the agro-products industry, actively participated in world’s largest food innovation exhibition, SIAL in Paris. The mega event inspired the food businesses from 16th to 20th of October 2016. The event hosted plenty of activities such as SIAL Innovation Observatory, Malongo Coffee Tasting, Fruit Juice, Mocktails and Smoothies Tasting, Cooking Show, Ingredients Innovation Tour, conferences, roundtables, culinary demos, competitions, etc. The wide range of agro-products offerings of Shimla Hills arrested the attention of numerous folks and they marched towards the stand to interact with the team. They raised queries on the specifications of the products, packaging, shipment, price, etc. and nodded to trust Shimla Hills for their agro-products supply. 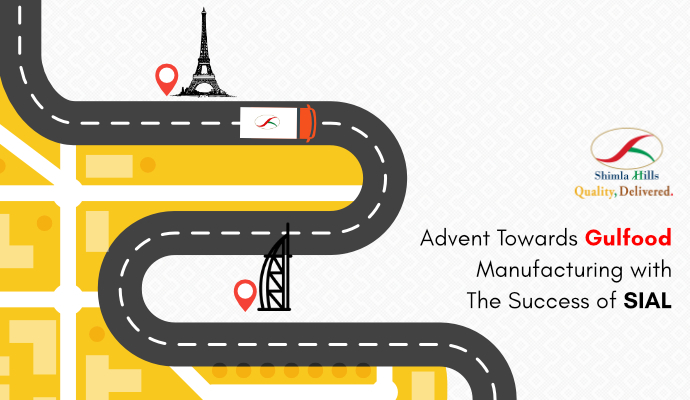 With the success of SIAL, Paris, Shimla Hills is now all geared up to visit one of the biggest food and beverage processing industry events, Gulfood Manufacturing 2016. The grand event is here with an amazing opportunity for the attendees to connect with suppliers from 60 countries showcasing the very latest manufacturing business improvement tools. Also, at Gulfood Manufacturing, 1,500 global suppliers of latest ingredients, processing, packaging and logistics solutions will be present to solve production, capacity and automation challenges. Again Shimla Hills will be captivating the attendees with its top-grade agro-products from 7th to 9th November 2016. Meet Team Shimla Hills at Gulfood Manufacturing 2016 at Stand No. S2-D6, Hall SSH2, Dubai World Trade Centre. Hope to meet you at Gulfood Manufacturing 2016!